Humble GS represents a 40 yr. culmination of the very best of the Galten Farms -- Schickedanz breeding program. We take immense pride in having bred many of the individuals who appear throughout his pedigree -- Humble is our masterpiece! We bred his father, Ferrari, and his grandsire, the champion hunter, Storyteller. On his dam side, we bred his dam, Haiti, and her sire, the PanAm Bronze Medalist, Amiego. Humble`s pedigree is a genetic dream -- Abiza, Heimische, and Bukephalos -- the best proven performance bloodlines in the Trakehner breed. Humble is competing at 2nd and 3rd level dressage, and doing it very well! Watch for him in 2013 with Olympic event rider, Jessica Phoenix. His scope and beauty over fences also want us to point him in the direction of the hunter jumper world--- he just has so much natural talent and athleticism! His first two foal crops have exceeded expectations -- they are outstanding! They have wonderful type with big eyes; beautiful, flashy bodies with great conformation; and just outstanding, powerful, yet elegant, light movement. "The moment he enters a space, Humble impresses with his calm, dignified manner. His intelligent expression and alert stallion presence is enhanced by an extraordinarily well set-on neck that immediately suggest a career in dressage, as does his elegant colour and bold markings. Although his stride is not overly huge, that may be a good thing. It is more than made up for by the dynamic and very special hock action, very good self-carriage at the trot in particular and sufficient freedom of the shoulders to give him expression and it makes him an easy type for even an amateur rider to collect. At the moment, he steps a little wide behind, but without repercussions; it would seem his testicles are in his way. 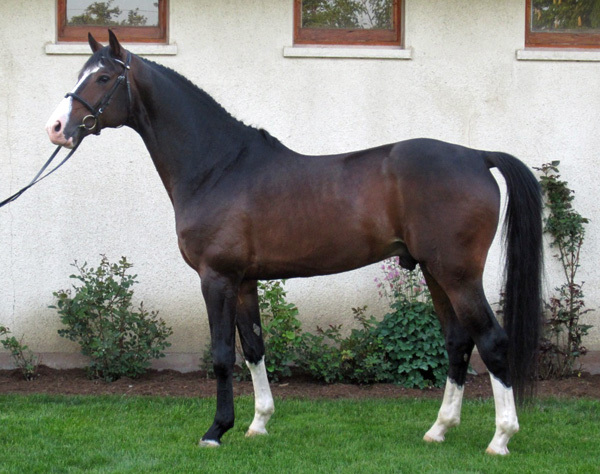 A degree of tightness in the loin is not uncommon to the Trakehner breed, which carries a goodly dose of Arabian blood, and that is what impacted his jumping style, where a rounder bascule and more flexible pelvis than he showed is more desirable. With his sterling character and exciting action, as a dressage performer and sire, he is sure to be a valuable contributor." You will not find a better quality stud anywhere, with brains to boot. Humble GS is the best of the best!